Yap State, within the Federated States of Micronesia, consists of a width of islands along an East-West axis in the Western part of the North Pacific. To the West and South, Yap is close to the Palau, then the Philippines, Indonesia, and Papua New Guinea. To the North, Guam and the Marianas are not too far off. And to the East, Yap is part of a scattering of islands that are known collectively as the Caroline Islands, which in turn lie within the larger region of mostly very small islands referred to as "Micronesia." Map of the Federated States of Micronesia, derived from one published in Atlas of Micronesia (Karolle, 1995). The Federated States of Micronesia emerged as a separate political entity with the dissolution of the Trust Territory of the Pacific, or TTPI. 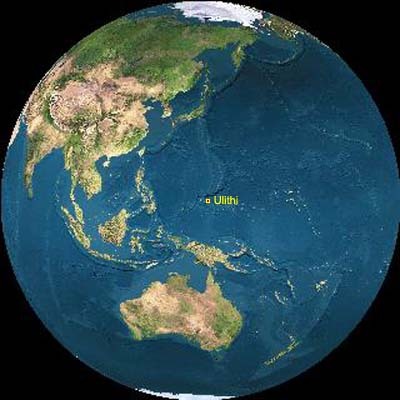 The TTPI was a United Nations mandate, managed by the United States, and comprised those island entities that had been Japanese colonies (and previously, German and Spanish colonies), in Micronesia. The TTPI was somewhat arbitrarily divided into administrative districts, with straight-line boundaries drawn through the Central Caroline islands. While some entities within the TTPI, such as Palau and the Northern Mariana Islands, negotiated independent terms with the United States, the three TTPI districts of Yap, Chuuk (formerly Truk) and Pohnpei united to form the new Federated States of Micronesia, or FSM. Within this new country,a portion of the former Pohnpei district was separated to make the state of Kosrae. Consequently, FSM has four states, and Yap is the Westernmost. CIA World Factbook map of the FSM. Yap State can be divided into two distinct spheres: "Yap Proper" and the "Outer Islands." Yap Proper is a cluster of islands sitting on the margin of the tectonic plate. Known as "Waab" to the inhabitants, these are relatively high islands with volcanic and continental rock, surrounded by a fairly wide reef platform (see map, next page). The language of Yap is distinct and not closely related to the languages of the Outer Islands. The Outer Islands are coral islands and atolls scattered over a wide distance, with relatively low populations. These islands are related linguistically and culturally as part of the "Caroline Islands." 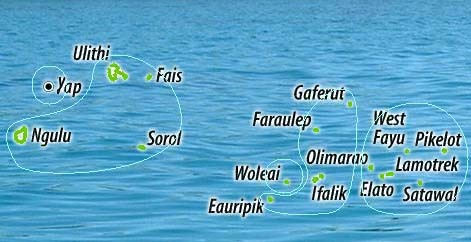 The Carolinian culture realm reaches East into Chuuk state and West to the outer islands of Palau (Sonsorol, Pulo Anna, Tobi). Carolinians also settled in the Northern Mariana Islands during the 19th century. The five Districts of Yap. Today the Outer Islands are subdivided into four electoral districts, with Yap Island making the fifth. But previously, all the islands that comprise Yap State were linked in a tribute system that reached from the Yap islands, all the way East to the outer islands of Chuuk. This connection still plays an important role in understanding the relationships and connections within modern Yap State. On the next page, we will look more closely at the atoll of Ulithi, and orient ourselves to its various features and locales.